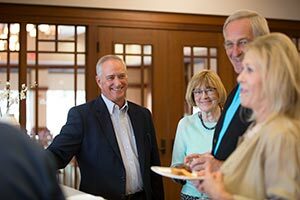 Find a little bit of everything when you dine at Masonic Village. 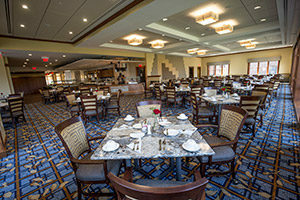 Each newly renovated venue offers a unique menu within an inviting atmosphere. Choose from a variety of meal plans to suit your lifestyle. 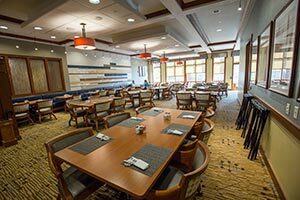 Newly expanded, the grill room offers indoor and outdoor seating. Enjoy hot and cold fare for breakfast. Try a sandwich and/or salad special for lunch, or select from six entrées. For dinner, choose one of six entrées or a nightly special. Hours: Open for residents Monday – Saturday, 8 to 10 a.m., 11:30 a.m. to 1:30 p.m. and 4 to 7 p.m. Closed Sundays. A new exhibition kitchen features a buffet line and a stone hearth oven, ideal for baking breads, roasts, pizza and even desserts. During the week, select one of four entrées or two specials each night. On Sunday, enjoy a variety of options at brunch. Hours: Open for residents Monday – Sunday, 4 to 7 p.m., and Sunday, 11 a.m. to 1:30 p.m.
Meet with friends for before or after dinner drinks and light appetizers. Hours: Open for residents Monday-Saturday, 3:30 to 7:30 p.m. Closed Sundays.